ONLY 375 HOURS AND READY TO SELL! BRING OFFERS!This stunning Azimut60 offers the latest Italian style and finesse both externally and internally. A three cabin boat-plus crew- with a full beam master cabin and iconic waterline panoramic windows, The acknowledged class leader from Europe's top builder. 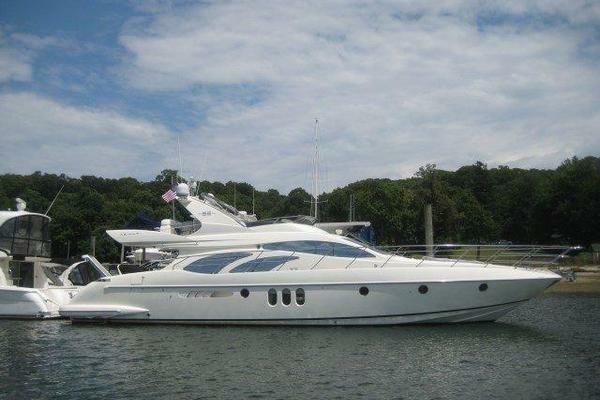 United Yacht Sales New Jersey would love to guide you through a personal showing of this 60' Azimut 60 Flybridge 2010. 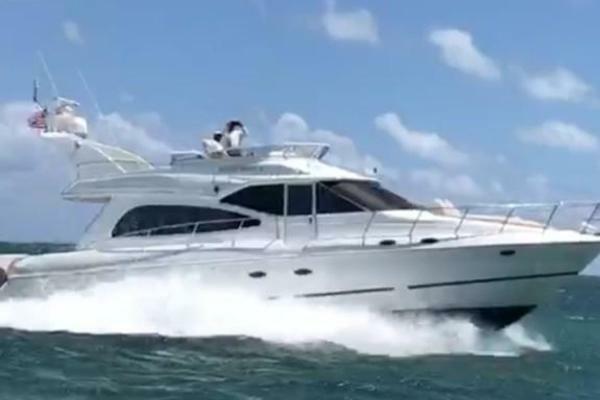 This yacht for sale is located in Pompano Beach, Florida and priced at $899,900. For a showing please contact us by filling out the form on this page and we will get back to you shortly! Layout Internal INTERNAL LAYOUT AND STANDARD EQUPMENT SALON 8-seat sofa on the port side Radio/CD player with remote control and two speakers DINETTE Relaxation area for 5-6 persons Decapé oak table with fixed center panel and extending top. HELM STATION Adjustable single pilot seat Desk for computer, courtesy and night-time navigation lights (red) Power steering Height-adjustable steering wheel The helm station includes: winch control rev counter hour meter engine oil pressure gauge ? marine gear oil pressure gauge engine water thermometers ammeters engine alarm LED series alarm for water in the fuel shore-on LED fresh water tank level gauge fuel level gauge rudder angle indicator trim tabs control with indicators washer-wiper controls ? Switches for: side windows that can be electrically opened, navigation lights, bilge pumps, chain washdown, battery parallel connection, instrument lights, horn, generator Switches for fans in the engine room (automatic and manual functioning with engines off) Electronic interfaced navigation instrumentsControl panel (control and selection of the power sources with bright indications and analogue instruments, bilge water alarm LEDs and high tank level) 12V cigarette lighter-type power socket CRUISE COMMAND electronic remote controls Engine start/off keys with button for engine Syncro operation Engine panel complete with optical and acoustic alarms Water and fuel level gauges Alternator ammeters. GALLEY 3 burner ceramic-glass hob with fiddle rail Microwave oven Worktop in granulon with two stainless steel sinks Extractor hood 130 l fridge with 220 V automatic power supplier + 56 l freezer Cabinets and drawer in decapé oak under worktop Walkway in decapé oak Cabinet for china, glasses and cutlery storage with crystal glass shelf Store room and service compartments adjacent to the cabin staircase. Lower deck cabins MASTER CABIN Queen-size bed with locker accessible from top Leather bed rim, oak and leather headboard Wardrobe with interior and inside shelves in natural cedar wood Large wardrobe on port side with natural cedar wood interiors and full-length mirror Built-in drawer unit starboard side Vanity unit with drawers Carpet Double curtains for windows Emergency exit via ceiling above the vanity unit Doors and frames in decapé oak Direct access to the master head compartment Azimut reading lights TV installation Wide windows in the hull that can be partially opened. VIP CABIN Leather bed rim Decapé oak and leather headboard Shelves above the windows One wardrobe on each side, with dress hangers and shelves. Wardrobe interiors in natural cedar wood Panoramic windows Deck hatch with shade and mosquito net Azimut reading lights Decapé oak doors and frames Direct access to head compartment. STARBOARD GUEST Twin beds Central nightstand and switches Built-in wardrobe with shelves and internal mirror (interior in natural cedar wood Carpet Round porthole Azimut reading lights Shelf above the porthole in decapé oak Doors and frames in decapé oak. MASTER HEAD COMPARTMENT Access from master cabin Separate shower with bench Shower column with soap tray and mixer taps Decapé oak wooden floor Air extractor TECMA WC Venetian blinds in wood Round porthole Storage cabinet behind the WC Storage behind the shower Shelf above sink with mirror. GUEST/DAYTIME HEAD COMPARTMENT Access from VIP cabin and from corridor Round Plexiglas shower with wooden grating Shower column with soap tray and mixer tap Round porthole Decapé oak wooden floor TECMA WC Venetian blinds in wood Shelf above sink with mirror. Cabin access corridor/stairway Cabinet with shelves. External layout External access via GPR stairway with teak steps up to fly bridge Fore windbreak in stainless steel and Plexiglas Pilot seat sofa (two seat) Unit with fridge and sink with running cold water C-shaped? sofa + relaxation area 2 storage lockers: 1 under the sofa and one on the front of the dashboard GRP radar arch for antennas, GPS, navigation lights, flagpole Stainless steel handrails Steering wheel in stainless steel (painted white) and height-adjustable steering Controls for: acoustic alarm, winch, trim tabs, chain washdown, service switches Chain meter counter indicator Manually adjustable searchlight Watertight radio/CD player connected to 2 speakers on the roll bar and 2 in the cockpit + remote control in cockpit Table The wheelhouse includes: Navigation instrumentation 12V cigarette lighter-type socket CRUISE COMMAND Single-lever electronic remote controls Engine start/off buttons Engine instruments with optical-acoustic alarms VHF radiotelephone Rev counter Alarm LEDs Trim tabs controls. Deck/Deck house Stainless steel handrails High resistant stainless steel and PVC guard Non-slip surface Anchor peak Two midship cleats Navigation lights 2 fuel fillers with protection cover Fresh water filler, starboard side in the anchor cover area 1 black water discharge on the port side. BOW Anchor chain compartment 25kg DELTA anchor, 75 m chain (dia. 10 mm) 1700W 24V winch Stainless steel anchor nose 2 fore cleats 3 electric wipers with windshield washer Sunbathing cushions Drinks holders Handrails. STERN Integrated fairleads in stainless steel Two stainless steel cleats, aft Antifouling paint Double saloon door in stainless steel and tempered crystal glass Hydraulic Bathing platform/tender lift, maximum lifting capacity 450 kg (dimensions: 3.45m x 1.1m) with teak laid floor Telescopic electro-hydraulic gangway (length 2.7 m), lifting capacity 300kg Bathing platform steps in stainless steel and teak Mooring hook Shore power socket/s Shower with hot/cold water Teak laid cockpit floor Cockpit bench Dimmers for cockpit light.